I am working on a Kenmore Washer (Model #110 92292800). I replaced the drive coupling already. When I looked under the unit I found a leveling spring on the floor. I checked the diagrams and info on the springs but they do not show EXACTLY how the leveling spring is attached. 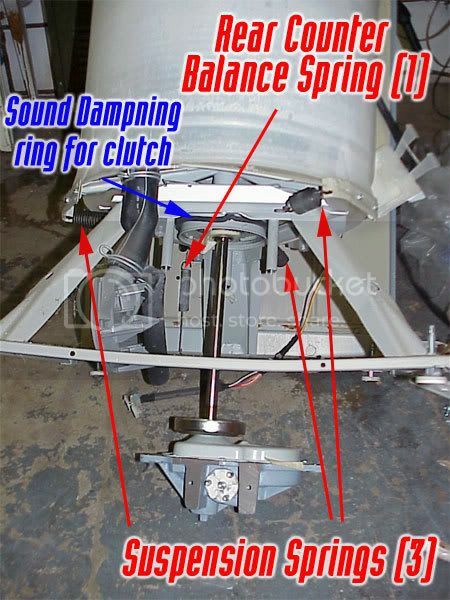 How does this spring attach – are there any photos on-line that show this? I have a good picture in the Appliantology Group showing the location of the most troublesome suspension spring. If that ain’t good enough, post your question in the world-famous appliance repair forum along with an illustrative photo of your washer. In addition to the internet’s premier appliance repair forum, the Appliantology Group houses the web’s largest repository of appliance repair photos and diagrams. This entry was posted in Washer Repair on January 1, 2005 by Samurai Appliance Repair Man.